In a post-apocalyptic world, players try to rebuild society. Using the debris, they build new towns for the remaining survivors to live in — but these friendly folks aren't the only ones still out there. Marauders want to pillage your town and see it burn. Scavenge what you can and build new structures to help you defend against the marauder threat. While you can get more things done in town when you house more survivors there, they all have to have a space to sleep or they might turn against you and join the marauders. 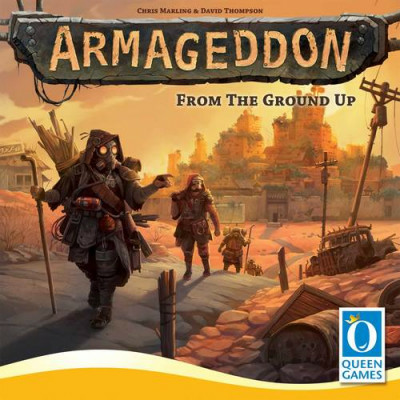 Armageddon is a family-friendly strategy game that offers many tactical choices and different strategies to claim victory.